As a measure of a hitter’s power, bat speed can provide a youth baseball player with a competitive edge. If a player boosts his bat speed by two miles per hour, he can hit the ball another 20 to 25 feet, according to former coach Dennis Tessicini of Taft High School on HittingWorld. The average bat speed for a youth baseball player depends on his age group, with older players swinging at an average speed of 60 miles per hour. There is a lack of research on the average bat speeds of Little Leaguers. 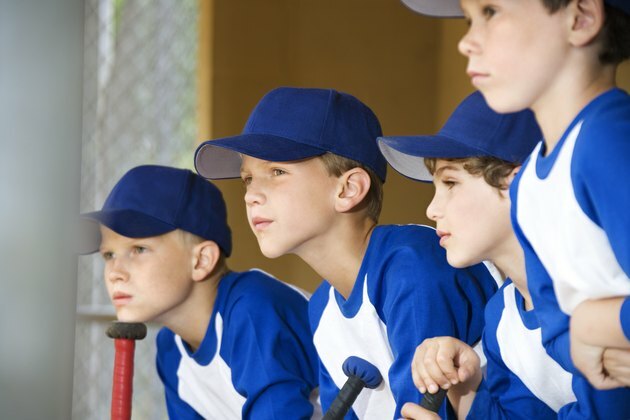 In addition, the average bat speed of Little Leaguers depends on the weight of the bat. For example, a heavier bat will reduce a young player’s bat speed. In a 1991 experiment published in “New Scientist,” researchers at the University of Arizona found that Little Leaguers ranging in age from 10 to 12 years bat an average of about 60 mph with a 10-ounce bat, 40 mph with a 20-ounce bat and 30 mph with a 30-ounce bat. These numbers correlate with the data on Little League swing speeds put forth by the Department of Physics at the University of Washington. There are two different types of speed -- bat and exit. Because exit speed measures how fast the ball comes off the bat, it’s more important than bat speed, which only gauges the speed of a player’s swing. The calculation of exit speed involves five factors: bat speed upon the ball’s impact with the bat, pitch speed at the plate, impact point on the bat (or the "sweet spot"), the composition of the bat and the composition of the ball. Exit speed tends to be about 20 percent faster than bat speed, according to eFastball.com. A ball’s exit speed initially rises with an increase in bat weight, but at a certain point, the increase in weight leads to diminishing returns. While a 41-ounce bat is optimal for a professional baseball player, a 16-ounce bat is best for a youth baseball player, according to David Russell at Pennsylvania State University. Because standard 30-inch wood or aluminum bats used by youth baseball players can weigh anywhere from 20 to 26 ounces, Little Leaguers tend to use bats that are too heavy. This can dramatically lower a young player’s bat speed and cause the bat to drag through the strike zone. Little Leaguers tend to believe that a bigger bat is better. Although a 27-inch bat is optimal for a youth player, he may boast about his new 31-inch bat at practice. A common problem among Little Leagues is using a bat that’s too heavy, according to “Managing Little League Baseball” by Ned McIntosh. This can result in a slower bat swing, a late swing and an inclination to foul along the first base line. By using a lighter bat, young players can maintain control over the bat as well as swing faster. Few youth baseball players can handle anything larger than a 28-inch bat. What Happens When Your Golf Grip is Too Big?